This textbook is suitable for the following courses: Introductory Economics and Principles of Economics. This market-leading textbook presents modern economics in a form that’s intuitive, relevant, and memorable to students with no prior exposure to the subject. Taylor and Weerapana have recent and extensive classroom-based experiences, which is seen through their engaging real-world examples. 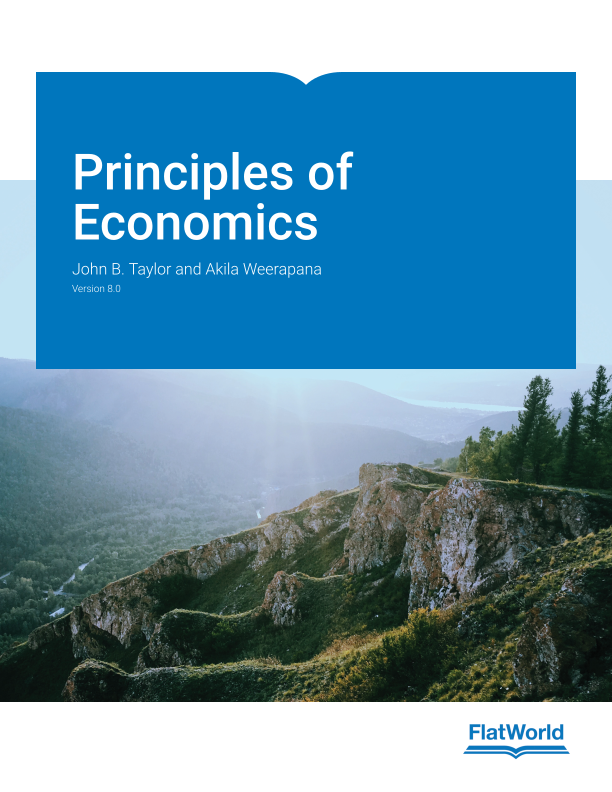 The textbook provides clear explanations of why markets are efficient when the incentives are right and inefficient when the incentives are wrong; and outlines examples of economics choices that students actually face. Version 8.0 gives special attention to key policy questions about the role of the government that are being debated today. This volume encompasses both macroeconomics and microeconomics. Covers the debate about whether the Fed is unwinding its extraordinary policy measures at an appropriate pace, as well as whether the fiscal policy measures implemented in the 2008/9 recession worked, based on academic studies. Discusses labor market developments, including the fall in unemployment rates, slow improvement in the employment to population ratios, and the falling labor force participation rate for men. Expands the discussion of productivity slowdown, including Robert Gordon’s claim that economic headwinds will keep U.S. productivity growth low in the foreseeable future. Carefully selected, revised and tested problems at the end of every chapter and appendix for the reader to work out. Questions for review appear at the end of every chapter. Definitions of key terms appear in the margins or hyperlinked online. 7.2 Are Competitive Markets Efficient?